Comparison of Local Review Sites: Which Platform is Growing the Fastest? Platforms with social polls and business reviews are continuously growing in popularity. It’s mostly because of the consumers willing to know more about a business they’re planning to deal with. Consumers make up to 93% of overall business review reading. The weak points and slowdowns of development of some of these web resources. We’ve checked out the information about more than 50,000 American businesses on the chosen local review platforms using our ReviewFlow monitoring system. We had to aggregate and anonymize a lot of data about various local businesses before we were ready to proceed with the study. We’ve chosen the period of the last five years and compared the annual and monthly results with each other. Additionally, we decided to concentrate on the period of summer 2016 – summer 2017 for a more detailed research. We’ve chosen the most prominent local review sites. All of them, except for the TripAdvisor, store the reviews about all sorts of industries and businesses. The TripAdvisor platform was chosen as a contrast to the local review web resources, due to its extreme popularity all over the world. That’s a very specific niche platform delivering its users the information about traveling and more. The reviews listed there can make a difference in comparison to the habitual general reviews on the local platforms. The foursquare platform is also on the list, due to its active social position. It contains local reviews on different businesses as well as ratings and public opinion polls. For the last several years, Foursquare has been focusing on the contact between local consumers and businesses. The professionals keeping this platform running do their best to make a stable connection between them. They’re still using social mobile applications to collect opinions of real consumers in the area. Unfortunately, they’re showing lame results. Read further for more info on the subject. We’ve decided to ignore such platforms as Trustpilot and Amazon, because they mostly contain general reviews, while we’re concentrated on the reviews of local enterprises. The following chart demonstrates the overall results of our analyses. 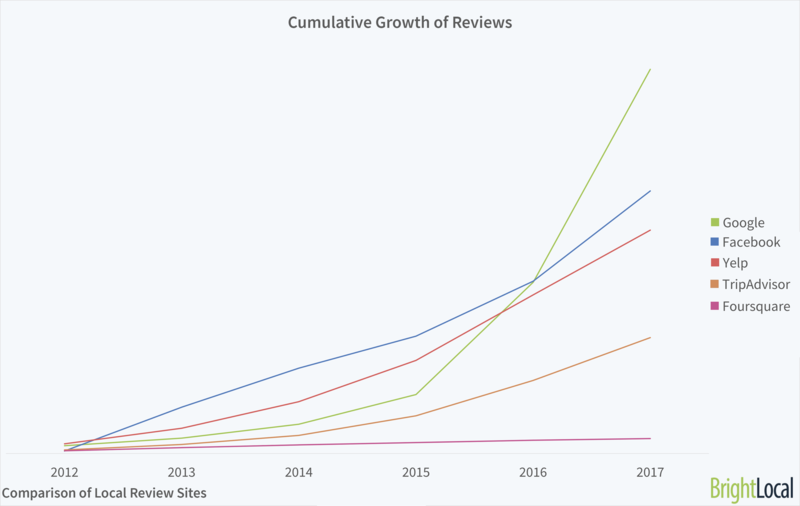 In comparison to the other review platforms, Google has demonstrated the greatest growth in the number of reviews since 2015. Yelp, Facebook, and Tripadvisor have also experienced a significant growth, but Google turned out to be the leader among them. Starting from 2015 Google has had a significant increase in the number of business reviews. The large scale of Google all along with its social outlook thanks to its Android integration attracts a huge audience of users and customers of the local businesses. The platform gives the users regular prompts to vote for this or that enterprise right on the spot. This creates a close-to-life fast-growing system of reviews. Foursquare hasn’t shown the significant growth over the same period. However, it’s fine, for the platform has changed its focus. The following chart demonstrates the growth of reviews in numbers in the period of the last year. Let’s see which of the review platforms has managed to show the best results recently. 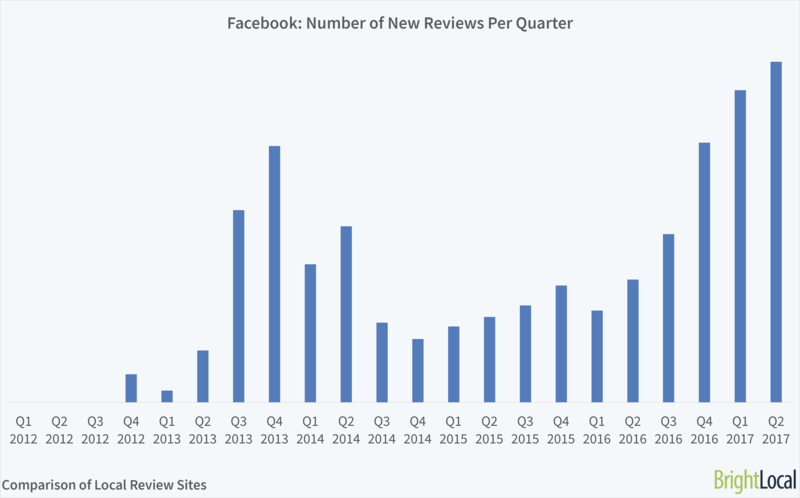 It’s clear that the most significant growth in the number of reviews was demonstrated by Facebook review platform (2012-2013). The reason is that those years Facebook launched the system of reviews and started encouraging users to participate in the polls and surveys. Unfortunately, in 2013 Facebook started to lose its potential as a local business review platform. At the beginning of 2016, the situation started changing for the better. In order to add more platforms to the comparison, we’ve decided to alter the graph. The following chart demonstrates the same picture as you’ve just seen above, but we’ve decided to adapt the diagram and flatten the Facebook’s spike in order to demonstrate the results of other business review platforms. The number of reviews on Google grows faster than on other platforms – the percentage grew up to 278% in the period of 2015-2016. The second platform showing significant results in comparison to Google is TripAdvisor. The percentage of reviews grew up to 82% in 2016. Unfortunately, the results of the previous year were better (115%). Facebook showed worse results in 2014-2015. However, 2016 turned out to be successful for the local review platform. The number of reviews on Yelp became smaller in 2014. However, since that time the situation has been changing for the better. The worst results were demonstrated by Foursquare. Unfortunately, the growth of reviews has significantly slowed down. The following chart demonstrates the number of new business reviews appearing on the investigated platforms. When we speak about the number of new reviews for one certain business, TripAdvisor is the leader here. In 2016, this frontrunner gained three times more reviews of typical businesses than Google. TripAdvisor mostly specializes in certain business, concentrating less attention on total reviews in comparison to such platforms as Google, Facebook, and Yelp. 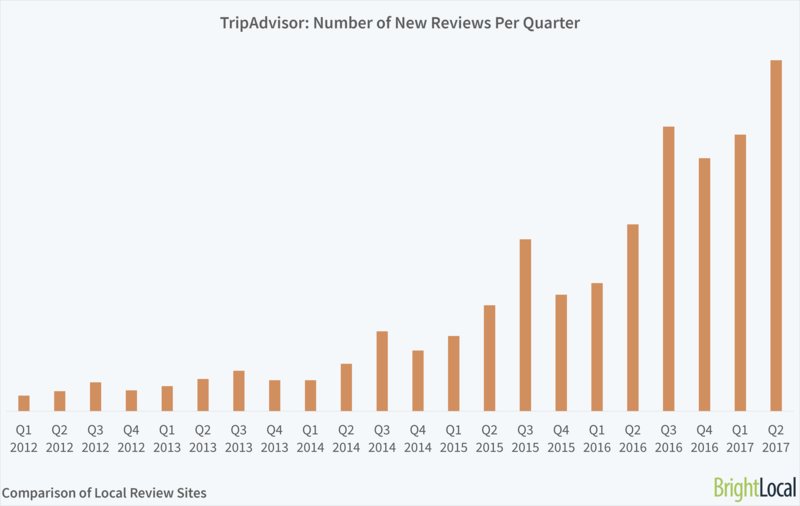 TripAdvisor gets less total business reviews than other popular platforms, but it specializes in particular businesses. The results of the study show that Foursquare has the smallest number of reviews per certain businesses in 2013 – 2016. At this period, the platform was changing in matters of activity of its users. 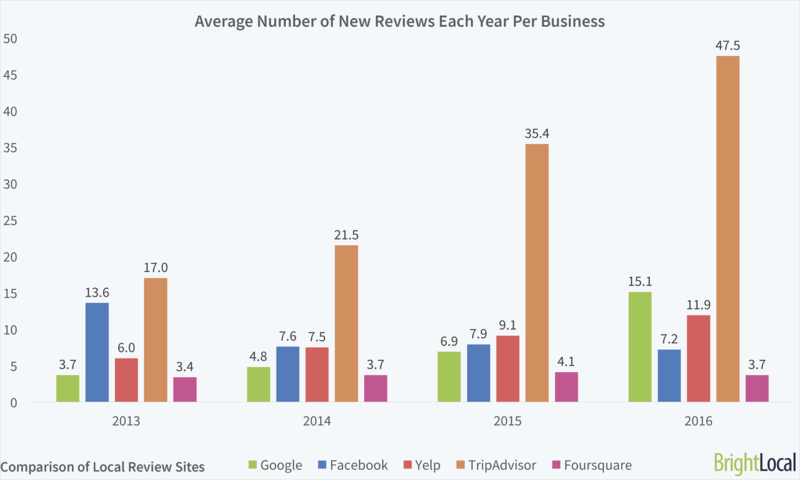 The number of fresh reviews per business went down to 3.4 from its peak of 4.1. However, it looks like Foursquare is getting along quite stable at this point. 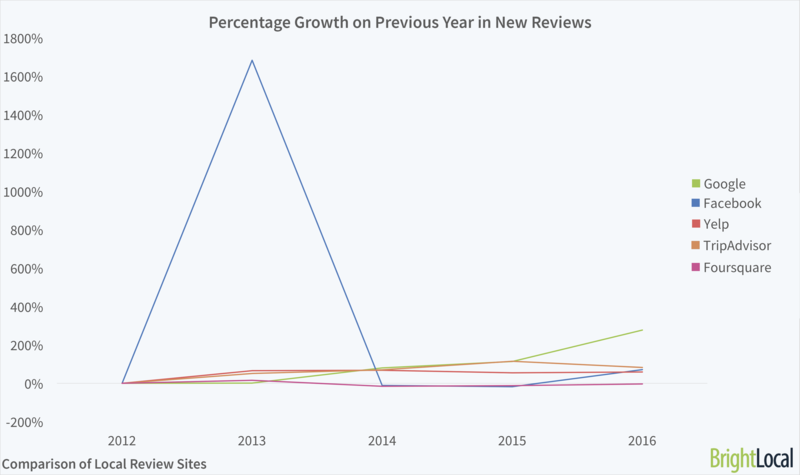 The growth of new reviews per business is steady. Yelp, as well as Google, have an almost equal output. The general number of fresh reviews per business has grown up in the period of the last several years. The year 2016 has demonstrated the growth of reviews to its peak of 11.9. It means that each year Yelp gets a couple of more new reviews per business. In 2016, Facebook has demonstrated a slight decrease in the number of reviews. It’s evident that at present Facebook is experiencing a downward movement. 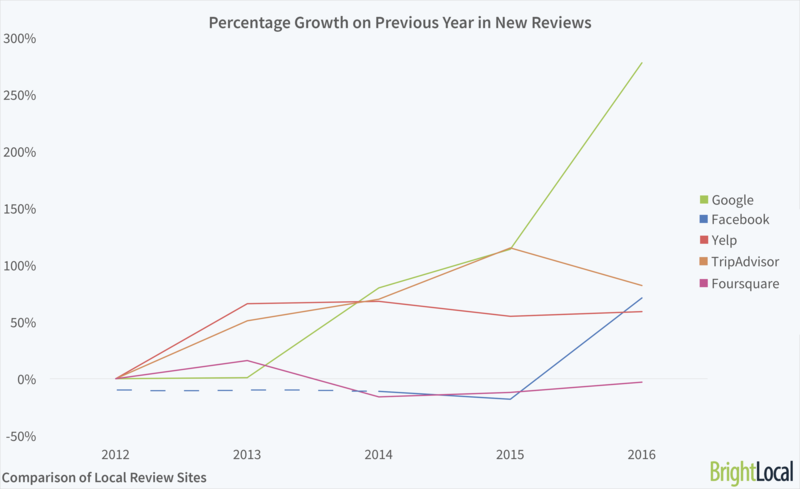 The first significant growth of new reviews per business was in 2013. Each of the businesses presented on the platform got about 13.6 new reviews. Several years later, in 2016, each of the typical local business received about 7.2 new reviews. This can be explained easily – the general number of business on Facebook has greatly increased. That’s why the engagement of users per business decreased. The chief function of Facebook is social networking and communication. It means that users do not have a direct intention to leave reviews. It’s important for the business to be present on the platform. However, the platforms should also realize, that businesses can make up a nice collaboration for them. This will give social platforms a chance to race with such giants as Google. Yelp, Google, and TripAdvisor have more reviews than Facebook due to the more active audience with direct intention to express their attitude to this or that enterprise. It usually happens thanks to the specific functionality to encourage their users to leave reviews using notifications. Moreover, such platforms as TripAdvisor and Yelp have the main and only focus on reviews. Google had a considerable growth in the number of reviews in 2016, which is a great result in comparison to the previous years. The number of new reviews doubled to 15.1. This way Google gets regular opinions and business reviews from its users. They’ve been prompted to do so and they don’t have to look for a certain web resource to leave a negative or a positive feedback. We’ve created this graph to show you how the situation with monthly business reviews has changed in the denoted period. There were certain highlights and fails that we need to point out. Google is the leader here with a massive growth of business reviews in 2017. Facebook was holding on to its stable position through the period, but not as fast and effective as Google. TripAdvisor, as well as Yelp, demonstrated the same stable speed. The general comparison shows that 2017 demonstrated better results than 2016 if to speak about the growth of monthly business reviews on all of the platforms. 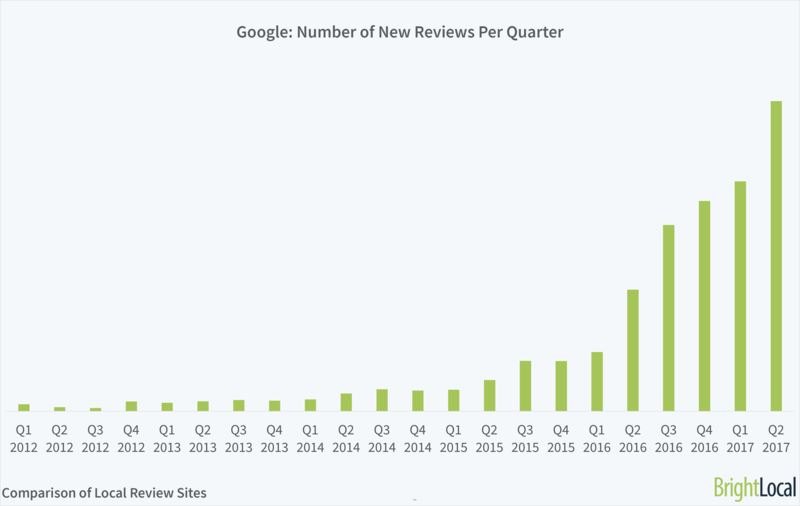 In spring of 2017, Google managed to break away from its competitors showing a great increase in the number of reviews posted on the platform. April and May of this year resulted in a 40% growth of monthly reviews. June was not as successful as the last months of spring, but July of 2017 compensated for that. The number of reviews during the month doubled in comparison to the previous year. Facebook started showing nice results in September 2016. In one month, the platform managed to get 33% of growth. In August-December of the same year, the results went on growing and in 2017, the number of business reviews per month got to its peak. Looks like this period was a great pride for Facebook, comparing to almost the same results of TripAdvisor. The curious thing is that the most successful period for Facebook, Google, and TripAdvisor was May of 2017. TripAdvisor demonstrates a significant summer peak starting from July and a notable growth in October 2016. The results of March-July 2017 turn out to be even better. It’s evident that TripAdvisor gets such an amazing performance thanks to a growing amount of trips in the holiday periods. Yelp was steady in the number of monthly business reviews starting from an unpredictable jump in October of 2016. The platform even managed to overtake Facebook. However, Yelp got back to its position with a stable growth of the number of monthly reviews. 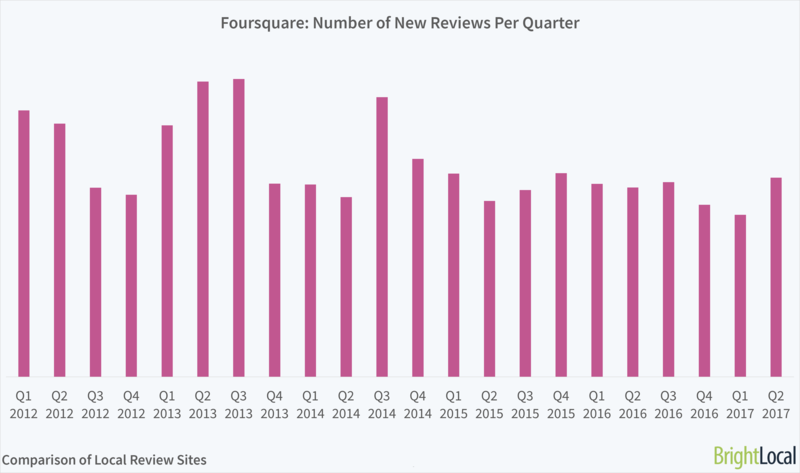 Foursquare demonstrated no significant growth in comparison to the other platforms in the research. Google showed amazing productivity in business reviews with relative calm in 2014-2015 and an amazing rise in 2016. Starting from this moment Google went into pole position and in 2016, the platform demonstrated a huge growth of business reviews – 278% and even more at the beginning of 2017. The start was pretty slow, but the general position of Google is evidently the leading one. Google demonstrated a 278% growth in comparison to the previous year in the number of new business reviews. Google presents itself as a platform for accumulating recommendations. It’s not surprising that millions of users choose it – that’s one of the most prominent environments of the business research process. The record-breaking growth of Google is explained by its ubiquity. Google long ago became one of the essential parts of any business development due to the easiness of use for the users and to its wise integration. Nevertheless, one of our recent surveys showed that Yelp and Facebook are more popular among the consumers. It means that Google has a lot to improve in addition to its stable integration in mobile platforms and a notification system. There’s still something to be done to get better mutual contact with the users. The trouble is that Google seems to be pretty annoying for the users with their regular notifications. Most users are just lazy react to another notification and leave a rating or a feedback. Some of the users even turn the notifications off because of their insistence. The development of business review system on Facebook started at the end of 2012. In December of this year, Facebook users got an opportunity to participate in the surveys and leave feedback. They could also share their impressions with friends. Starting from 2013, we noticed a great growth in a number of reviews appearing on the platform. In 2013-2014, business reviews became incredibly popular. Unfortunately, starting from 2015 the platform didn’t manage to keep the progress the same. From this moment on it became less reliable for the users and business owners. However, you shouldn’t think that Facebook is leaving the race. It’s actually still getting the strength. Slow but steadily. In November 2016, the platform managed to grow up to 64% for reviews. It means that Facebook is still quite popular, but it has a lot to improve to be able to compete with Google. Let’s hope that 2018 won’t be a fail for the platform. Recent Facebook changes in the feed policy affected the visibility of what users and publishers see. Facebook pays more attention to the posts that provoke discussions. It definitely affects the advertising system. It may lead to the necessity for the local businesses to pay for the advertising to be seen by the potential customers. There’s also a problem with a limited access to a Facebook Local app. In January of 2018, Google Play Store demonstrated a worse download statistics than ever. If they want to stay keep the trust of the users, they’ll have to pay special attention to mobile advertising and the activity of the users in the app. This platform has been steadily developing throughout the years up to 2017. The number of reviews grew from 55% to 68% last year. There was a slight drop in the number of reviews at the beginning of 2017, but in the second part of 2017 it got back to normal and went up. Yelp had troubles in 2016, but in May of 2017, the situation changed for the better. It looks like the beginning of this year stimulated Yelp for serious measures. They recognized the problems and took measures to get back to stable development. May, June, and July demonstrated the stable growth of reviews on the platform. At the end of 2017, Yelp promised to focus on business affairs and contact with the customers. They’ll concentrate on the business review strategy and they’ll do their best to encourage the users for more reviews. TripAdvisor is situated in a specific niche, that’s why it’s no surprise that the platform has the same amount of reviews as Facebook, Google, and Yelp. Looks like the growth of reviews on the platform is slowly decreasing. The percentage changed from 115% in 2015 to 82% in 2016. However, the platform experienced an impressive growth in the last quarter of 2017. TripAdvisor went through a stormy 2017. The platform had to do its best to get the attention of the users back. We can only hope that these difficulties won’t make s reflection in the future development of the platform. Platforms working in a certain niche never attract a great number of general reviews due to the specific industry sector. That’s the reason why it has the power to compete with the leaders. The platform does its best to keep the customers coming and leave reviews. Foursquare has already left its leading position. The platform has low review rating and its future is quite vague in comparison to the leaders. The trouble is that they’ve stopped concentrating on the recommendations of the customers. They’ve got significantly fewer reviews per business in comparison to the leaders. At present, Foursquare is selling its data set that can be used for further development recommendations for other platforms. Unfortunately, Foursquare is not the right place to seek for the relevant information on local businesses. Statistics say that a usual customer studies no less than seven reviews before he or she decides to trust a business or not.